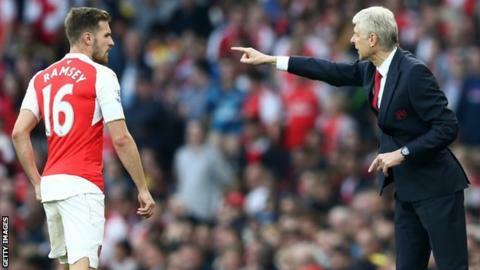 Arsenal manager Arsene Wenger says he did not blame Wales boss Chris Coleman for Aaron Ramsey's injury. Coleman accused Wenger of a "cheap shot" after the Frenchman suggested Ramsey's hamstring injury was caused by playing for Wales. Wenger reiterated it would have made sense not to have played Ramsey or Real Madrid's Gareth Bale for the full game against Andorra. "I didn't blame anybody," said Wenger. "I just said it would have made common sense not to use Bale or Ramsey once they [Wales] were qualified." Wenger says Coleman could perhaps have sent Bale and Ramsey on with 20 minutes remaining against Andorra, adding it "would have helped the clubs". Ramsey played against Andorra on 13 October with Wales already assured of a placed at next summer's European Championship. The midfielder came off during Arsenal's win over Bayern Munich, three days after playing 90 minutes at Watford on 17 October. Coleman said he had received no communication from his Arsenal counterpart about Ramsey before the Euro 2016 qualifier against Andorra. "If Wenger had a problem with me or my selection, call me up," Coleman had said to journalists on Wednesday. But Wenger responded on Friday: "I said in that press conference I cannot call all the managers. "I didn't blame him especially. I just think we analyse the reasons why our players get injured and you always think in a period like that the player, if they can have one game less, it's not too bad. "I don't believe there's anything spectacular with a desire to blame anybody." England boss Roy Hodgson has backed Coleman, saying club bosses have more chances to rest players.